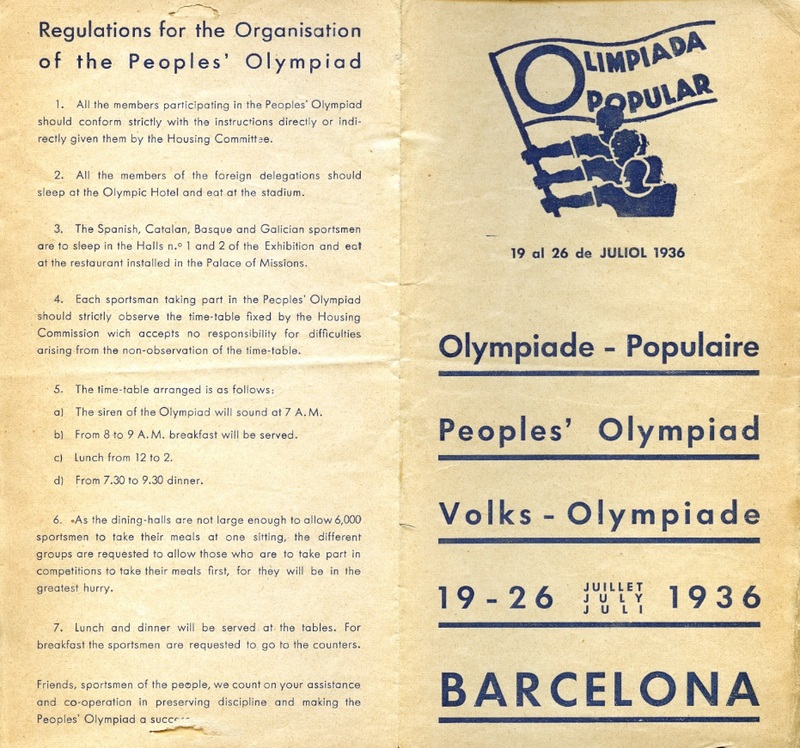 People’s Olympiad program in scrapbook, 1936; Bernard N. Danchik Papers; ALBA 033; Box 2; Tamiment Library/Robert F. Wagner Labor Archives, New York University. There has been no shortage of discussion regarding the non-athletic aspects of this year’s Winter Olympic Games in Sochi, with activists expressing concern about various issues, including corruption, terrorist threats, human rights violations, regional conflict in the Caucasus, looming debts for citizens of host cities, and the evictions and displacement of local residents, to highlight just a few. Despite the intentions of many to focus solely on the pageantry and athletic competitions, the modern Olympic Games cannot avoid political undertones. Although rare, certain countries have boycotted the Games to protest the International Olympic Committee, specific participating countries, or other elements of contemporary politics. The United States notably boycotted the 1980 Summer Olympics in Moscow to protest the Soviet invasion of Afghanistan; in response, 14 nations, led by the Soviet Union, boycotted the 1984 Summer Olympics in Los Angeles. Stamp in scrapbook, 1936; Bernard N. Danchik Papers; ALBA 033; Box 2; Tamiment Library/Robert F. Wagner Labor Archives, New York University. The 1936 Summer Games in Berlin were highly controversial due to the rise of Adolf Hitler and Nazism following the host city selection in 1931. While Hitler viewed the Games as an opportunity to promote his governance and racial ideology, other nations questioned whether the games should be allowed to continue, and individuals debated whether they should participate. 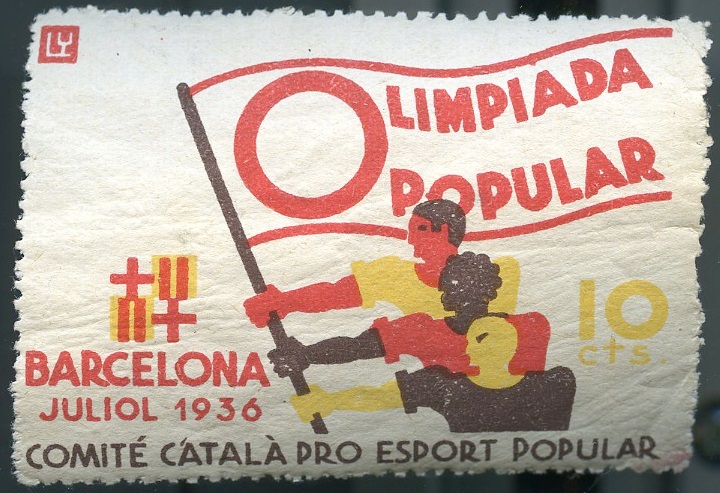 In Spain, the newly elected Popular Front boycotted the Games and organized the People’s Olympiad to be held in Barcelona immediately preceding events in Berlin. Approximately 6,000 athletes from 49 countries registered, with most teams formed through trade unions, socialist parties, communist parties, and other left-wing organizations. 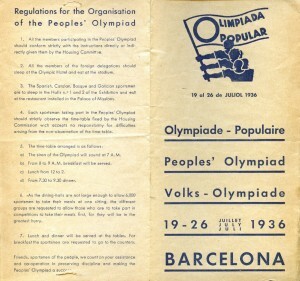 In addition to traditional sporting events, the People’s Olympiad intended to include several “non-competitive” events, such as music, theater, and folk dancing. The alternate games, however, never took place, as it coincided with the beginning of the Spanish Civil War. Some athletes were unable to get to Barcelona, while others were already in Spain and left the country quickly. A few remained to join units defending the Spanish Republic against Nationalist factions. Bernard N. Danchik of Brooklyn was a clerk and member of the Bookkeepers, Stenographers, and Accountants Union. He was also a member of the German Labor Lyceum gymnastics team and the captain of the Williamsburg Gymnastic Group. Along with the Committee for Fair Play in Sports, Danchik helped assemble a team of amateur athletes for the People’s Olympiad. He, along with eight other American athletes, sailed to Spain and arrived in Barcelona on July 15, 1939. 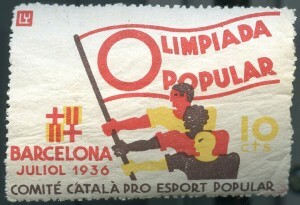 On the day the Games were set to begin, athletes awoke to the sound of gunshots in the streets and remained sequestered in their hotel, venturing outside only to replenish necessary provisions or participate in a parade with other athletes in support of the Spanish Republic. The American delegation eventually returned to New York on August 3. Their coach, Alfred “Chick” Chakin, had been so affected by the experience that he quickly enlisted in the International Brigades and returned to Spain, where he was captured and executed by Nationalist forces in 1938. 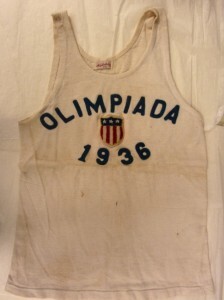 Olympiada Barcelona uniform tank, 1936; Bernard N. Danchik Papers; ALBA 033; Box 3; Tamiment Library/Robert F. Wagner Labor Archives, New York University. Danchik kept a journal of his experiences during the journey, which he used as the basis for a scrapbook that also includes letters, brochures, mementos, souvenirs, photographs, and newspaper clippings. 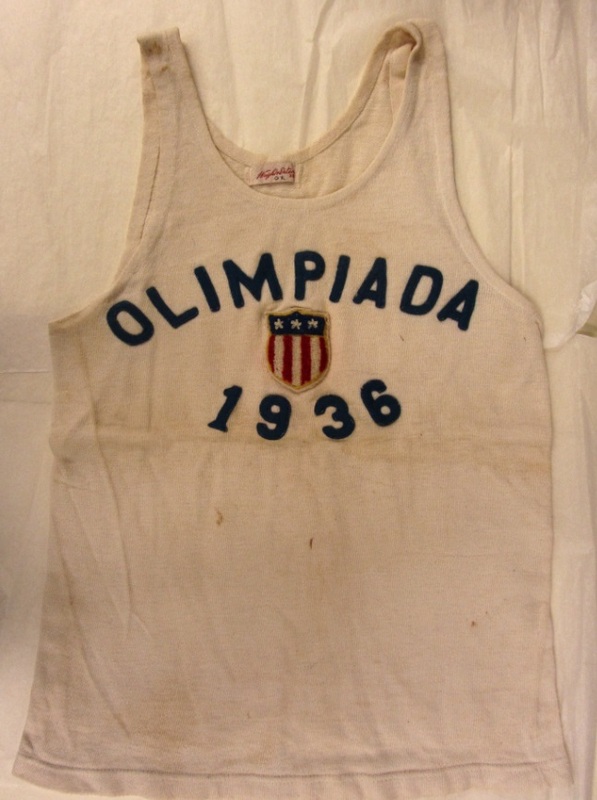 This scrapbook, along with correspondence and select artifacts (including team jackets and uniforms for the games), comprise the Bernard N. Danchik Papers (ALBA 033), part of the Abraham Lincoln Brigade Archives at Tamiment Library. They not only document the history of Spanish Civil War, but also reveal a glimpse of counterfactual history, offering a possibility of what might have been had events played out slightly differently. I am the Accessioning Archivist at New York University Libraries. Past positions include Archives of Irish America Archivist at the Tamiment Library and Robert F. Wagner Labor Archives, Metadata Cataloger at the John F. Kennedy Presidential Library, and Archives Assistant at the Roman Catholic Archdiocese of Boston. I hold an MA in History and an MS in Library and Information Science with a concentration in Archives Management from Simmons College; as well as a BA in English and History, and a Certificate in Celtic Studies from the University of Wisconsin-Milwaukee. And I enjoy puns.